This product is a multi-purpose cart or wheelbarrow with an advanced patented design that is engineered for particular ease of handling — there is no lifting required to haul a very heavy load! Instead of lifting, you just push down on the handle and start moving the load which is now balanced over easy rolling dual pneumatic tires. The unique easy dumping application gives you improved stability, balance and operation. Push the Load Dumper up to the spot where you want the load and push the load forward. The Load Dumper wheelbarrow has a unique hinged mechanism that enables you to tip the entire wheelbarrow, or just the tub, for easy unloading. The mechanism allows you to easily dump the load on the right spot with little effort. With a tough 500 pound load capacity, this versatile cart can take tough treatment. Its unique dumping mechanism also can be very helpful for loading. By tipping the container up you can roll heavy stone or other heavy objects into the container and then tip the wheelbarrow back and the load is ready to move with little strain on your part. 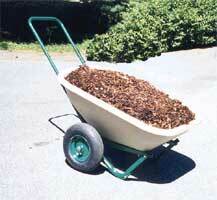 The Load Dumper has a heavy duty, non corrosive polyethylene tub. The all steel tube chassis is powder coated to resist rust and the pneumatic tires gives you a smooth ride. 6 cu. ft. capacity at 42 pounds with 13” tires. It is available in many independent garden centers.